Outside the learned sphere of Sanskrit, vernacular dialects (Prakrits) continued to evolve. The oldest attested Prakrits are the Buddhist and Jain canonical languages Pali and Ardha Magadhi, respectively. By medieval times, the Prakrits had diversified into various Middle Indo-Aryan dialects. 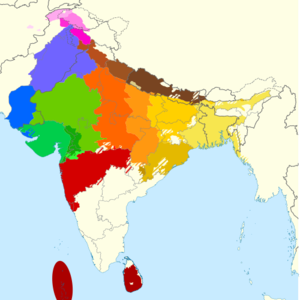 "Apabhramsa" is the conventional cover term for transitional dialects connecting late Middle Indo-Aryan with early Modern Indo-Aryan, spanning roughly the 6th to 13th centuries. Some of these dialects showed considerable literary production; the Sravakachar of Devasena (dated to the 930s) is now considered to be the first Hindi book. The next major milestone occurred with the Muslim conquests on the Indian subcontinent in the 13th–16th centuries. Under the flourishing Turco-Mongol Mughal empire, Persian became very influential as the language of prestige of the Islamic courts due to adoptation of the foreign language by the Mughal emperors. However, Persian was soon displaced by Hindustani. This Indo-Aryan language is a combination with Persian, Arabic, and Turkic elements in its vocabulary, with the grammar of the local dialects. The two largest languages that formed from Apabhramsa were Bengali and Hindustani; others include Sindhi, Gujarati, Odia, Marathi, and Punjabi.